Above is a sample of a cut and pierced lampshade made by artist Marie Bauman of Troy, Pennsylvania. The lampshade is shown with the light off and on displaying the style and design. This lampshade is 7 inches diameter at the top, 16 inches diameter at the bottom, and has a 17 inch drop. A fabric braid trim has been placed along the top and bottom of the shade for a finishing touch. 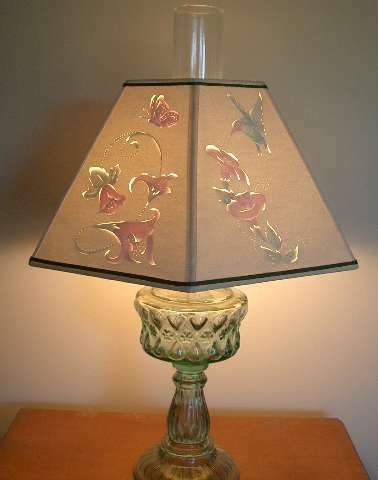 Marie has painted the inside of the lampshade with watercolors and cut designs in the paper to enhance the light pattern when illuminated, as well as provide a texture-like pattern when the light is off. Above is a sample of lampshades designed and created by Marie. 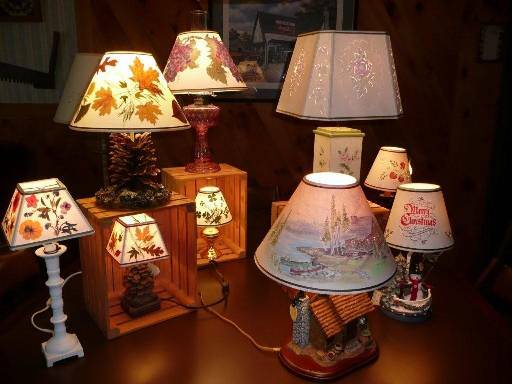 Several types of lampshades shades are available. These include lampshades such as botanicals (real leaves and flowers), hand made papers, custom design, and cut and pierced. Please click on the various links to see the varieties of lampshades and lamps that are available. Several types of lamps are in stock. 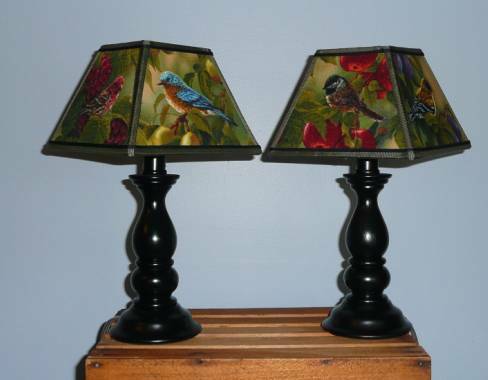 The main purpose for maintaining an inventory of lamps is to allow the artist to design various lampshades for them and for display purposes at shows. These lamps can be mixed and matched with the various shades created, or purchased by themselves. This inventory changes frequently and the lamps shown are a representative sample of the types of lamps available. Click here to see different lamps to choose from in addition to the lamp bases shown below. Below is a very nice, quality lighthouse that was custom built by a local craftsman. This is a limited inventory item. 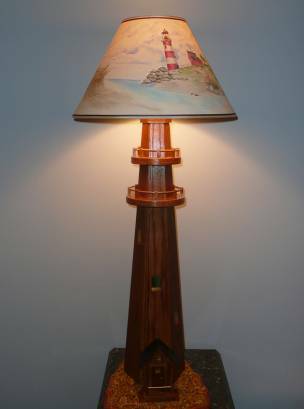 Lighthouse Lamp with a Handpainted Shade -- 38" high. Some lamp bases are available that have figures that are enhanced with matching shades. Click here to see accent lamps and shades like the one shown below. Click here to send an email for more information on the size, shape and price of any of the lampshades above.